There are a lot of articles circulating on the internet every day which attract our attention. Some more interesting as others but in the end the internet has shown to be a useful source of information. Recently I was pointed at an article (or a speech if you like) on twitter. This speech was held by Klaas Knot, President of the Netherlands Bank, which you probably all know from a previous post on my blog...Will the Dutch gold ever come home? In this speech Mr Knot addresses the problems of Europe facing today, and how it did come this far. Because of the very well documented and clear speech, I decided to place it on my blog in the original form. This is a speech which isn't brought to you by mainstream media but is essential to get a clear view on Europe today and in the future. I can fully endorse the recommendations and conclusions drawn by Mr Knot. Hope you can appreciate the first "guest post" on this blog, I certainly did! Speech by Mr Klaas Knot, President of the Netherlands Bank, before the OMFIF (Official Monetary and Financial Institutions Forum), London, 17 February 2012. Thank you for this opportunity to exchange views with you on this topical issue. Thank you also for arranging for me to do so amid the splendour of this magnificent hall. I feel quite safe standing here, for I understand the Armourers’ Hall was among the few buildings that escaped destruction in the Great Fire of 1666, and, in 1940, also survived a major blitz on London, while the surrounding area was devastated. So one might say that this venue symbolically suits my subject of today, for I am confident that in the distant future we will be able to say that EMU still survives. Speaking of which, I couldn’t help but notice that the title of my talk as announced in the flyer is “The Future of European Monetary Union”, instead of “Economic and Monetary Union” which the term “EMU” stands for. Don’t worry, you find yourselves in good company; many European governments are only now starting to realize that they haven’t paid enough attention to the “E” in EMU. My talk today consists of two parts. In the first part, I’ll focus on why it is that, for the Netherlands in particular, it is so important that the European project will be successful. 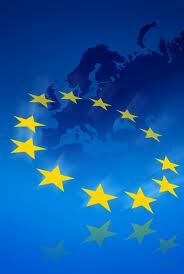 In the second part, I’ll discuss the implications of the European sovereign debt crisis for the future design of EMU. I will argue that at the root of the crisis we find some individual euro area countries pursuing wrong policies and a failing system of mutual surveillance in the euro area. These deficiencies pose a number of challenges for the future of EMU. While the introduction of the euro has increased macroeconomic stability and furthered trade and financial integration, the sovereign debt crisis clearly demonstrates that the job is not done yet. The alliance of the Netherlands with Europe has always been strong and will remain so in the future, if only because of its small size and geographical location. The same holds true for the other “low country”, Belgium. By nature, Dutch people have always had a strong focus on Europe. Just to illustrate this point, every pupil in high school has to learn at least two foreign European languages. Foreign residents in the Netherlands even complain that it is hard to learn Dutch in Holland, because everybody they speak to in Dutch replies in English, French or German. 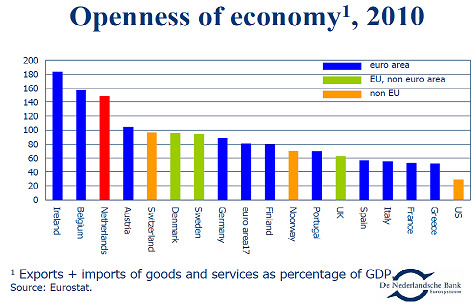 Another way to illustrate the Netherlands’ focus on the outside world is to look at the openness of its economy. If you take a look at Chart 2, you find openness defined as exports plus imports as a percentage of GDP. As you can see, in the US, exports plus imports are less than 30% of GDP. In France, Italy, Spain and the UK, this indicator is between 53 and 63%. In the Netherlands, exports plus imports are nearly 150% of GDP, and in Belgium and Ireland even more. As a consequence of this openness, the realization of the single market and the introduction of the euro later on did have a substantial positive impact on the Dutch economy. After all, one of the most significant yields was the boost that EMU provided to trade. Driven by lower transaction cost, lower exchange rate risks and more market transparency, trade within the euro area developed more strongly than outside the euro area. Being a country of trade and distribution by tradition, the Netherlands has taken advantage of these circumstances. For sure, it is one of the reasons why the Dutch economy outperformed the euro area in terms of GDP growth in 14 out of the last 20 years. 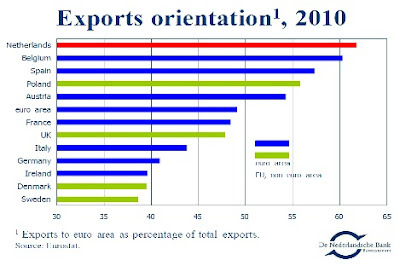 The strong alliance of the Dutch economy with Europe in general and the euro area in particular also shows up if we look at its exports orientation. In Chart 3 you see this defined as exports to the euro area expressed as a percentage of total exports. It follows that the orientation on the euro area is the largest in the Netherlands. More than 60% of our exports goes to euro area countries. Given its close ties with the euro area, it is obvious that for the Dutch economy a solution of the European sovereign debt crisis is of vital importance. If EMU were to fall apart, the consequences for the open Dutch trading nation would be severe. Therefore, Dutch policy-makers and central bankers should do their utmost to solve this crisis. In what follows, I will first focus on the causes of the sovereign debt crisis. Finally, I will present my views on the implications for a stable design of EMU. Over the last couple of months, European policy makers have done a lot to restore confidence. 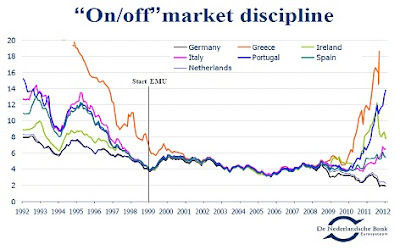 As a consequence, most stressed sovereign debt markets have calmed down substantially (left-hand side of the graph). The most important development was the announcement and finalisation of the Fiscal Compact, in which the political leaders of the euro area countries (and most other EU countries) further strengthened the rules governing budgetary discipline in Europe. Furthermore, in March the capacity of the EFSF/ESM will be evaluated. We have to conclude that the EFSF in its current form (based on guarantees) and size unfortunately has failed to convince markets that all countries will get through this crisis unharmed. This is why we as central bankers call upon the European governments to increase the emergency facility as soon as possible. The ECB also took further measures to avoid the sovereign debt crisis from severely dragging down the real economy. It did so by introducing a refinancing operation with a maturity of three years. As Chart 4 shows, this operation attracted a lot of interest, with a total volume of EUR 490 billion (right-hand side of the graph). This is not all “new” liquidity by the way, since banks also rolled over operations with shorter maturities into this new facility. This provides them with the liquidity security they need in light of the market tensions and, thus, helps prevent a sharp reduction in credit supply to the economy. At the end of this month, a second three-year operation will be carried out. In analysing and solving the sovereign debt crisis, the focus was on fiscal and monetary factors rather than on the macroeconomic causes of the crisis. However, as I’ll briefly demonstrate by means of Charts 5, 6 and 7, these causes are at least as important as the fiscal slippages some countries allowed themselves. At the start of EMU, per capita income levels between countries differed significantly. It was assumed that catching-up countries would experience faster economic growth. This is what did happen, but not quite to the extent expected. Prior to the crisis, mainly Ireland, and to a lesser extent also Greece and Spain, showed signs of real convergence. 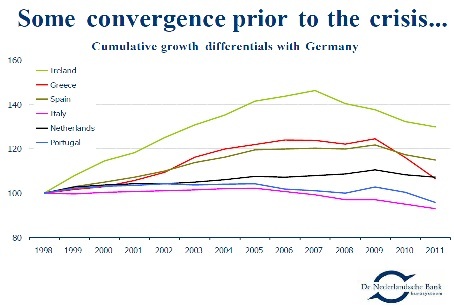 Their cumulative growth differentials compared to Germany reached 20 to 45% in 2007. Note that Italy and Portugal hardly experienced any real convergence towards the German welfare level, even before to the crisis. Even the Netherlands “converged” more than these countries. Unfortunately, the catching-up process largely took place through debt, either public or private. 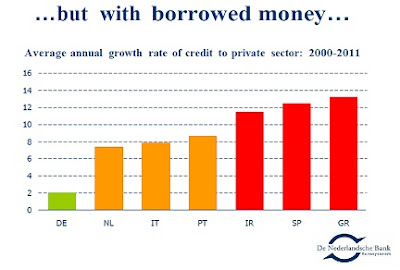 As Chart 6 shows, in some countries credit to the private sector grew by more than 10% a year for over a decade. As a result, their debt with the rest of the world ran up tremendously. This was most dramatically the case in Ireland, which moved from a net creditor position of 52% of GDP in 1999 to a net debtor position of 71% of GDP in 2008. Note that the Netherlands is not doing particularly well with regard to this measure either. This is mainly the result of the growth in mortgage loans. In my view the high stock of mortgage debt is among today’s biggest vulnerabilities of the Dutch economy. Besides being largely based on credit, real convergence was accompanied by high inflation, as you find visualised on Chart 7. Whereas Germany experienced lower inflation compared to the euro area average, the inflation rates in Greece, Ireland, Spain and Portugal were much higher than the EMU average. This substantial deterioration of competitiveness mainly reflects the development of unit labour costs. The economic developments in Germany in the last decade have been phenomenal. The time that Germany was called the sick man of Europe is not so far way. Partly due to the supply of many low-paid workers from East Germany, the labour market institutions in Germany were no longer sustainable. This has led to the so-called Harz reforms, which made the German labour market more flexible and tempered unit labour costs and inflation. 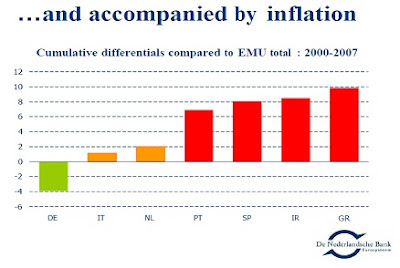 Before EMU, the current euro area countries followed different economic strategies. Between 1970 and 1999, unit labour costs in Germany, the Netherlands en Austria grew by a factor of 2.5 to 3. During these 28 years prior to EMU, unit labour costs grew by a factor of 12 in Italy, 14 in Spain, 35 in Portugal and 55 in Greece. By regularly devaluing their currencies, these countries were able to restore competitiveness. But after the launch of EMU, this policy option was no longer available, of course. The hope was that these countries would adapt to this new reality and unit labour costs growth would slow down. But has this happened? 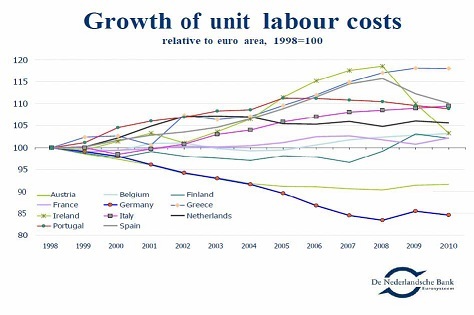 Chart 8 shows the cumulative growth of unit labour costs relative to the euro area average from the start of EMU. While countries like Germany, Austria and Finland continued their modest wage policies, unit labour costs in Southern European countries went up at a much higher pace, undermining their competitiveness. This proved unsustainable. The countries that found themselves in the top of the chart when the sovereign debt tensions started in 2009 – that is Greece, Spain, Ireland, Portugal and Italy – all ran into trouble one after the other. Currently, adjustments are hard-handedly being enforced by the markets. In the said countries, Ireland excepted, product and labour markets didn’t function properly and they still don’t. Markets are over-regulated and labour markets are highly inflexible. By addressing these problems, labour productivity can increase, thereby lowering unit labour costs. I am not saying this will be easy, but I’m convinced that such steps are absolutely necessary for EMU to function properly. As the chart also shows, in the Netherlands unit labour cost growth was also relatively high during the first years of EMU. This, however, wasn’t caused by the high inflation rates and low flexibility of the labour market, but reflected the low unemployment rate in the Netherlands in that period. For many years, the unemployment rate in the Netherlands was the lowest in the euro area. The divergences in unit labour cost developments and price competitiveness within the euro area are reflected in the current account balances of the individual countries. 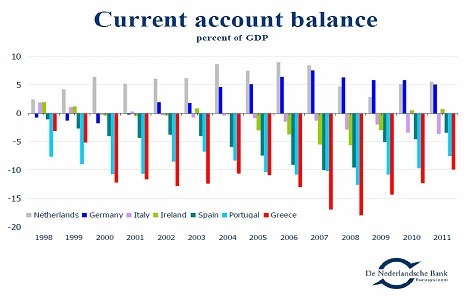 As you can tell from Chart 9, before the crisis, most southern European countries and, to a lesser extent, Ireland experienced high and steadily increasing current account deficits, while the current account surpluses of Germany and the Netherlands improved further. 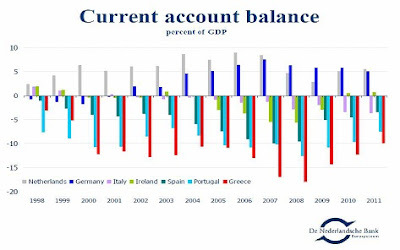 For many years it was thought that in a monetary union, the current account balances of individual countries were no longer relevant. It was only the balance of payment of the euro area as a whole that mattered. We know better now. 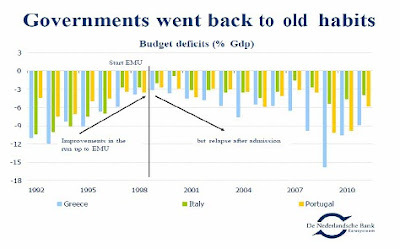 Of course, besides competitiveness problems, the crisis also had fiscal causes. As can be told from Chart 10, the stability and growth pact didn’t prevent some governments from taking up old habits once they had fulfilled the convergence criteria that enabled them to join EMU. We shouldn’t forget, however, that this was facilitated by some of the core countries of EMU. When it became clear that fiscal policies in these countries wouldn’t be able to meet the rules of the Stability and Growth Pact, it was not the policies that were changed but the Pact. This was clearly a mistake. Besides, the gradual worsening of the budget balance in countries like Italy and Portugal was partly due to their competitiveness problems. Since devaluing out of these problems was no longer an option, the declined competitiveness slowed down economic and employment growth. This dampened tax revenues while stimulating social security expenditures. Looking at it this way, the lack of fiscal discipline partly reflected the lack of macroeconomic discipline. More in general, budgetary policy was supposed to absorb temporary cyclical differences, by allowing the automatic stabilisers to do their work. For example, during a downturn, public spending automatically goes up as more people receive unemployment benefits, while tax revenues decrease. Such “automatic” response to cyclical developments stabilises the economy. But in most member states, the automatic stabilisers have failed to operate properly since 1999. Instead, a number of governments followed pro-cyclical budgetary policies, by loosening the budgetary reins during the economic booms, and tightening them during the busts. In other words, budgetary policies have hampered the functioning of EMU. Budgetary discipline in EMU was supposed to be exacted not only by the stability and growth pact, but also by market discipline. Markets were expected to restrain profligate governments by charging them higher interest rates and, thus, forcing them to change their ways. 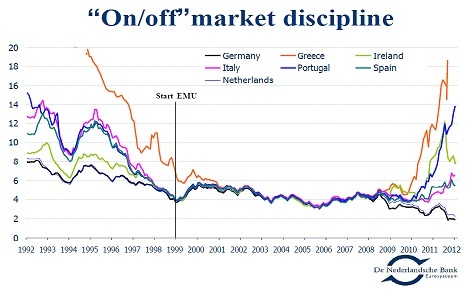 As is evident from Chart 11, market discipline was largely absent during the first ten years of EMU, allowing governments to pursue unsustainable policies. And when markets finally started to differentiate between governments, they did so with a vengeance. Although market discipline is now imposing necessary corrections, a stable monetary union cannot be based on this mechanism. So what would a stable monetary union look like in my view? As I argued earlier, some euro area countries have not fully adapted to the fact that they lost the option of devaluation in order to restore competitiveness. If they had, they would have increased their flexibility and growth potential by reforming their labour and product markets. Given the spillover effects of postponed structural reforms on the functioning of EMU, these reforms cannot be the sole responsibility of the governments concerned, but should also have a “European” dimension. This can take different forms. One way could be to strengthen the macroeconomic imbalances procedure, by increasing its focus and enforceability. This could be done, for instance, by introducing more reversed Qualitative Majority Voting in these areas. Another way would be to introduce minimum standards or best practices in policy areas where spillovers have turned out to be especially high, such as labour market policies. Importantly, what should be avoided is harmonisation towards some kind of EMU average, as this would force strong countries to reduce their competitiveness. Secondly, debt ratios should gradually be brought well below the ceiling of 60%. This lower debt ratio can only be realised and maintained through independent enforcement of the European fiscal rules and by anchoring these rules in national legislation. A politically independent European authority that can increasingly intervene in the fiscal policy of countries breaking the agreements is essential here. If – and only if – these conditions have been met, eurobonds could be a serious option. 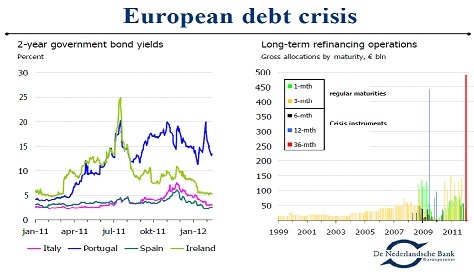 Eurobonds could enhance the stability of EMU in several ways. They would prevent a liquidity problem in one euro area country from needlessly transforming into a solvency problem. Moreover, they could provide a fire wall against the danger of contagion. Although eurobonds are not suitable as a crisis instrument, they could be the light at the end of the tunnel for the people of vulnerable euro area countries. For the people in those countries need to feel that their sacrifices will contribute to a permanent solution; one that will safeguard them from the short-sightedness of both politicians and markets. 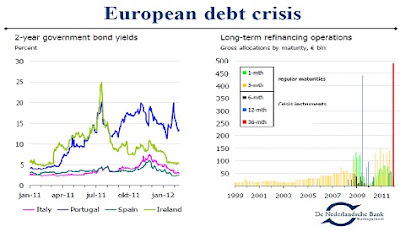 As I said at the beginning of my presentation, it is obvious that for the Dutch economy a solution of the sovereign debt crisis is very important, given its strong connections to the euro area. And therefore, Dutch politicians and central bankers should do their utmost to solve this crisis. But what is it we can offer? In my opinion a lot. Pragmatism, common sense and a focus on problem-solving are crucial now and the Dutch happen to be famous – not to say notorious – for these characteristics. Although we can be very principled on some issues and in many cases see eye to eye with the Germans, these typically Dutch characteristics could help divided euro area countries to stick together and solve this crisis. Pointing at the long-term perspective of eurobonds once the necessary conditions have been met, is an example of this pragmatism and focus on problem solving. Let me finish this presentation by saying that finding a structural way out of the crisis will not only be beneficial for the Netherlands, but also for the euro area, the rest of Europe, and, yes, even for the world economy. As I get more and more questions about the Dutch housing market (particularly from abroad) it seems a nice idea to write a post about it. 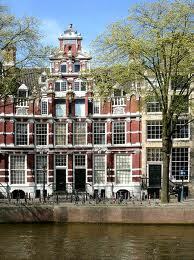 We all know the problems of the American housing market but what do we know about the Dutch? I can hear you think, what's the significance of the Dutch market worldwide? Marginal indeed, but what I will try to make clear is that the significance to the Dutch economy as a whole is far greater than thought of at first sight. We're going to look at the way this market has been organised and financed in the past and what probable changes are going to take place in the future. With the knowledge that almost all houses in the Netherlands are bought with the use of a mortgage let's have a closer look on how this works. Before the crisis of 2008 it was very common, for people living together, to get a mortgage based on two incomes. With a modest income in the Netherlands at € 32.500 this would make € 65.000. With this € 65.000 it was possible to borrow up to 6 or more times the annual income. This has never been an official rule. The rules implemented a certain percentage of housing costs a month, but in the end it turned out to be even more than 6 times. Maybe it is unnecessary to say that when there was a change in the income negatively the problems immediately occurred. The problems though were not as big as they are today, because most houses were sold for a price higher than the mortgage. Nowadays it's organised a bit different. Today the highest income is used in combination with an ever decreasing part of the second one. This does mostly result in a mortgage of 4,5 times the annual income. Across the internet we often are confronted with the following sentence: "Gold is money". This is brought up as a reason for people to buy gold. 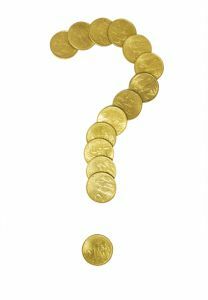 There are numerous of people seriously thinking our next monetary system will use gold (and silver) as some kind of money. Because these commodities today aren't used as money there should be a big, big price advantage for the clever guy to step in and buy these commodities. As I also believe there are once in a lifetime opportunities here, it's not because of this money reason. This post should try to clarify the current situation. How do people come to this thought of gold is money? Will it eventually make things functioning better than they are today, and is it even possible to happen? For me to come to an answer at these questions I think it's important to define what is meant by the term "money". Ludwig von Mises describes it this way: Money is a medium of exchange. This is a view from the Austrian School. My take on this is a little different, but instead of making this subject even more difficult let's stick to this definition. The next time I use the word money I hope we can agree on the fact that we mean the medium of exchange. The content on this site is provided without warranty, express or implied. All opinions are those of the author and may contain errors or omissions. No material here represents investment advice and you should not base your investment decisions on what you read here without performing your own due diligence and/or seeking professional advice, as appropriate. Actions taken as a consequence of any analysis, opinion or advertisement on this site are taken at your sole responsibility.